Even though NASA also focuses on asteroid threats, new research recommends that they have to also look just beyond the orbit of Jupiter, where the distant comets lie in wait. We know that a comet strike may have wiped out the dinosaurs, and another incident like that would mean major destruction for Earth. Hundreds of these huge comets, called 'centaurs,' have been found in past 20 years. Centaurs are essentially balls of ice and dust, but the actual threat is their unstable orbit that starts just beyond Neptune. They can be 31 to 61 miles wide. A single centaur comprises more mass than the whole population of Earth-crossing asteroids discovered to date. Their unstable orbit let them zip pass quite closely to the orbit of Jupiter, Saturn, Uranus, and Neptune. Occasionally, the gravity of the Gas Giant can pull a comet into the inner parts of the solar system and send it racing towards Earth. This, the scientists say, occurs once about almost every 40,000-100,000 years. As the comets get more close to the sun, they start to disintegrate, splitting into debris tails and “making impacts on our planet inevitable.” The research team explained in the Royal Astronomical Society journal, Astronomy and Geophysics “The disintegration of such giant comets would produce intermittent but prolonged periods of bombardment lasting up to 100,000 years” NASA observe the 'extraterrestrial impact' of objects in the asteroid belt, which is located between mars and Jupiter. The researchers reason that concentrating on near-Earth asteroids undervalues the nature and scale of potential giant comet strikes. 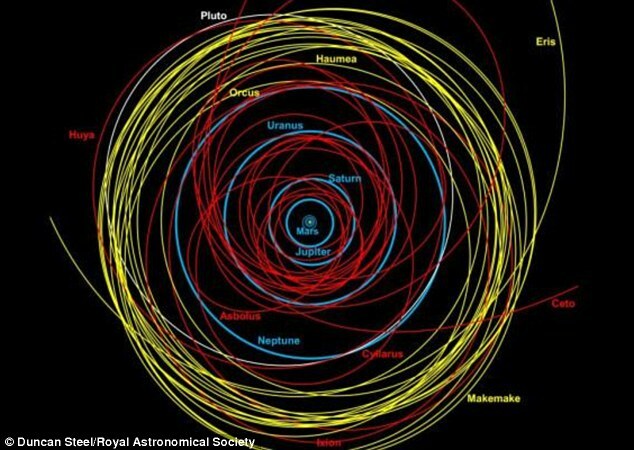 NASA tracks almost 12,992 near-Earth objects which have been revealed orbiting inside our solar system close to our own orbit. It approximates about 1,607 are categorized as Potentially Hazardous Asteroids. The up-to-date study suggests several hundred more Centaurs must be added to the list of space rocks that pose serious threat to Earth.